Shipping cases exist in many variations, from shipping tubs and LCD cases to custom built wooden crates. The latter are particularly important for the transportation of valuable and delicate items like art and antiques. Such items can be easily damaged in transit, and, therefore, it is crucial to choose the right packaging method and certainly the right shipping crate for each of them. At Fine Art Shippers, we have been providing our clients with professional art shipping and crating services for more than 20 years, and we can guarantee that every single item packed by our team arrives at the destination safe and sound. It is also worth noting that while art transportation is our major specialty, Fine Art Shippers is also proficient in shipping electronics and many other fragile items of any size and weight. Plus, did you know that we provide trade show transportation services both in the United States and abroad? In this blog post, we are going to tell you about shipping tubs and other commonly used shipping cases designed for the transportation of graphics, screens, trade show materials, and equipment safely. Graphics cases with molded-in handles and wheels. Ideal for the transportation of graphics because they can withstand the rough treatment of the loading dock. Shipping tubs on wheels. Made of heavy-duty molded plastic, they are perfect for handling big displays and transporting modular units or large panels. Rail Pack cases provide a great solution to transporting a variety of contents, including thin and long items like poles, tripods, and lighting equipment. LCD and Plasma cases with special foam interior for the safe and secure transportation of different fragile screens, including LCD and Plasma. 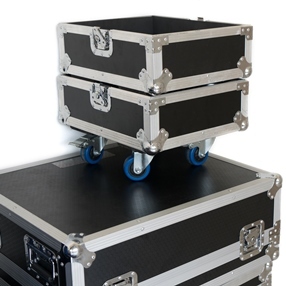 Flat Pack cases made of durable polyethylene with built-in straps, handles, and wheels. Ideal for transporting lighting stands, graphics panels, displays, and trade show materials. Rolling trunks made of lightweight molded plastic. Such cases are an excellent choice for shipping various industrial tools, literature, and other trade show materials and goods. Wooden crates for shipping especially fragile and delicate items. Such crates should be ordered from only experienced companies offering packing and crating services professionally. Whether you need shipping tubs or custom built wooden crates, Fine Art Shippers will ensure that you have the right case for the right use! Moreover, all our services are available at very attractive prices to meet any trade show transportation need and budget!